This compact one bedroom apartment is on the lower floor of Cashew Villa. The apartment has a fully equipped kitchen.The living and dining area is on the small outdoor terrace, with spectacular sea views, a great spot to view a Caribbean sunset. The shower has shuttered window which opens out to the magnificent Piton view. Cashew Villa is perched on a ridge, high above the Caribbean Sea. The pool deck and living areas offer spectacular views over the sea, and the Piton Mountains. The self-contained apartment on the lower level can be rented separately or along with the main villa. The accomodation suits outdoor types, there are a lot of great walks nearby. Rental car or jeep is recommended but not essential. The town of Soufriere is 1.5 miles away, Anse Chastanet Resort, Marine Reserve and beach 1 mile away. In the Area: Cashew Villa is located high on a ridge between the town of Soufriere and Anse Chastanet beach, home of the Anse Chastanet Resort. The beach is public, and a favourite of our guests. Available facilities include snorkeling and scuba diving in a Marine Reserve, mountain biking, tennis, windsurfing, sunfish sailing, and a great beachside restaurant for lunch and dinner. There are many more dining options in and around Soufriere, from local chicken and rotis to top quality international cuisine. Just outside Soufriere you will find the Diamond Mineral Baths, Botanic Gardens, waterfalls, Rainforest, and 'Drive-in' volcano. Around the island: Soufriere is located on the south-west coast of the island, on the Caribbeean Sea. Part of the Windward Island chain, St. Lucia measures only 20 miles long by 14 wide. The interior is rugged, with lush tropical rain forest covering the steep mountain slopes. The most impressive mountains are the twin Pitons, sheer-walled peaks which rise up from the sparkling Caribbean Sea. The coastline offers many wonderful beaches, ranging from the golden shell sand of Reduit Beach in the north, to the dark volcanic sand of Anse Chastanet Bay in the south. Supplies: There are several grocery shops and a Saturday morning market in Soufriere. Basic supplies are readily obtainable, even on a Sunday morning. The sound of a conch shell tells you when fresh fish has been landed. A 'starter-pack' for first breakfast is included, and additional supplies can be ordered ahead of time, just e-mail a list and pay when you get here. Our housekeeper, Berthia, is available to cook local-style meals, if required. Window opens out to spectacular Caribbean and Piton view. Maid service on three days per week included. 'Berthia' can also cook, babysit, do laundry, etc. for modest additional fee. The apartment has twin beds, but these can be made up as a king - please advise your preference. Electricity - island is on 240 volts, both 240v and 110 v are available in the apartment. The trade winds keep the area cool, and there is a ceiling fan over the beds. Joyce and Chris have a beautiful property with what could be the best view on the St Lucia island. It is stunning, including the sunsets. It is located high on the mountain and is quiet and private. I strongly recommend renting the upstairs home. The home does not have air conditioning (but then, neither do the very expensive rooms in the nearby Jade resort). The upper portion of the home has good air circulation, the rooms below do not have it and they are baked by the afternoon sun--making sleep difficult downstairs. The pool was crystal clear and comfortably cool. Note that it is nearly all deep and not usable by non-swimmers without a flotation device. We loved it. We watched the sun set from it each night we were there. Stunning. The grounds were immaculate. The road there is a mountainous drive over broken concrete/gravel roads. We rented a small SUV that handled it well. Many people just hire someone to drive them around while on the island (driving is on the left side of the road in St Lucia). Joyce and Chris can help direct you to someone. The home is in between the beautiful town of Soufriere and Anse Chastenet beach. We went scuba diving daily in Anse Chastenet through Scuba St Lucia. It was marvelous. The snorkeling was also marvelous. Soufriere is in the center of most sites to be seen: the volcano, gardens, Tet Paul Nature reserve, waterfalls, the Pitons, and three beautiful beaches. Soufriere has several restaurants that serve local foods. The refrigerator was stocked with breakfast items, which was very convenient and much appreciated. Again, the home is beautiful, the views are stunning, and the pool is refreshing. Unless you are accustomed to a warm, humid climate, we recommend renting the upper house. During the last few years, we've been holidaying around the Caribbean and stayed in similar type of accommodation. We can wholeheartedly say that Cashew Villa is one of the best places we stayed in. Having your coffee in the morning (or a beer if you like) by the pool overlooking the Pitons is something that will stay with you for the rest of your life. The villa is located in one of the most beautiful parts of St. Lucia, the view is amazing and you will have plenty of beaches and snorkeling places around. It has everything you need but even if you want something on top of that you can count on Berthia or Alvin to assist. Part of its beauty is the fact that the villa is surrounded by the rain forest and the sound of nature (tree frogs, cicadas, etc.) during the night time is amazing. After a day of snorkeling they didn't bother us but if you're a light sleeper you should bring some earplugs. If you are spending the evening time outside on the terrace, don’t forget to turn off the lights inside or close the doors/windows as insects will be attracted by the lights. The only minor problem we had was finding the place, partly because the directions provided were quite basic, partly because after a long haul flight our orientation skills were not at their best. Some road signs on the last part of the road would have made it a lot easier for us. All in all, this is a five star place in our books and we'll definitely be back in the future. We had a wedding in early January at a nearby villa and rented the Cashew Villa for some of our wedding guests. Chris and Joyce, the owners, were very friendly and easy to work with during the reservation process. 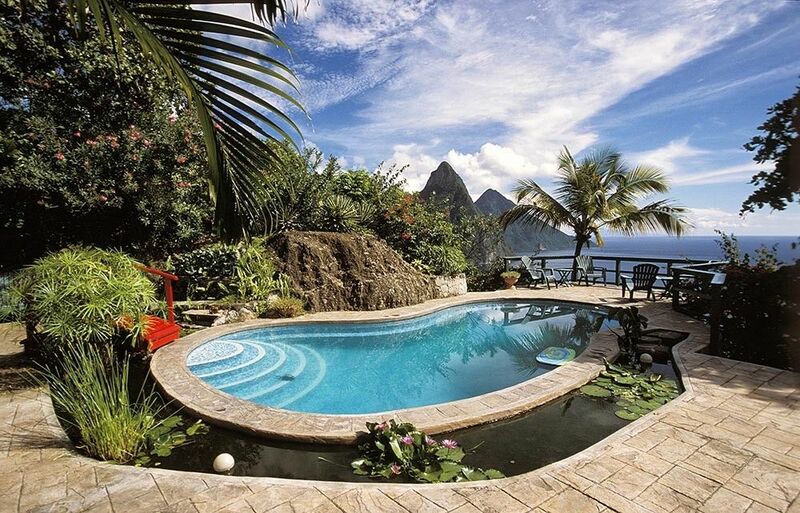 Our guests loved the grand view of the Pitons from the deck and how relaxed they were at the villa. The road up to the villa is quite steep; we highly recommend a 4WD or hiring a driver. View! View! View! Wonderful Sunsets and sooo many Stars! If you want complete relaxation away from it all, just enjoying the peace and quiet, this is the place for you. Just spent 5 days in this appartment and would recommend it to anybody who's not too fussy about their home comforts - no air con, ok facilities but fairly basic, birds and bugs galore - just for the view! It isn't mentioned in the description but car hire is absolutely essential, access is on a very steep and bumpy track, you couldn't really walk anywhere from the villa. You can have a car delivered to the villa if you don't fancy driving there straight from the airport. That's what we did and it saved us trying to find the place on our own, we just got a taxi from the airport. Otherwise the description and photos give a good idea of what to expect, the place is clean and well maintained. The appartment is small and we were lucky the villa above was empty so we had the pool and garden to ourselves, otherwise it would have been a bit cramped. The main feature of the appartment is the terrace - did I mention the view! - but it is in full sun all afternoon, so again, we were lucky to have exclusive access to the shady area around the pool upstairs. Who needs nightlife when you get those sunsets! Great welcome from pool guy, housekeeper and owner, all very helpful and friendly. Nearest beach is at Anse Chastanet resort, they'll let you use it even if you're not a resident. Avoid the beach restaurant at lunchtime - ok at best. Rest of the resort is a bit of a concrete carbuncle. Soufriere town is a bit rough around the edges but great fun to go and buy fruit and veg from the street stalls and you can find all basic supplies and a few eateries. Lots to do around Soufriere: great botanical gardens, sulfur springs, rainforest ...etc. Best local restaurant we found was at Ladera resort - again great views! Restaurant is called Dasheene and serves modern caribbean food, lots of interesting use of local produce. Also worth going to the restaurant at Fond Doux Estate, a cocoa plantation with nice grounds. Cashew Villa is located close to the Pitons World Heritage Site, and offers unsurpassed views of these spectacular mountains. The Rainforest Reserve and Soufriere Marine Park are all close by. The nearest hotel is the world famous Jade Mountain at Anse Chastanet. The traditional Caribbean community of Soufriere and the World's only 'Drive-in' Volcano are only a short drive away. 50% non-refundable deposit required to confirm booking. Shorter stays are possible - to calculate the daily rate, divide weekly rate by 6. Rates include a 'starter pack' for first morning's breakfast - tea, coffee, milk, cereal, juice, etc.